During the meeting, they have discussed the latest political and security developments, resolving the problems between the federal government and the region according to the constitution. His Excellency Prime Minister has confirmed on the unity, the sovereignty of Iraq and that the citizens of the region are part of the Iraqi people, reassuring on the importance of the re-activation of all federal authorities in the region, including border crossings and airports. His Excellency has pointed to the continuation of the work of the specialized committees to reopen airports after the completion of all procedures to return the full federal authorities, indicating that the international borders must be under federal control as one of the exclusive powers of the federal authority. 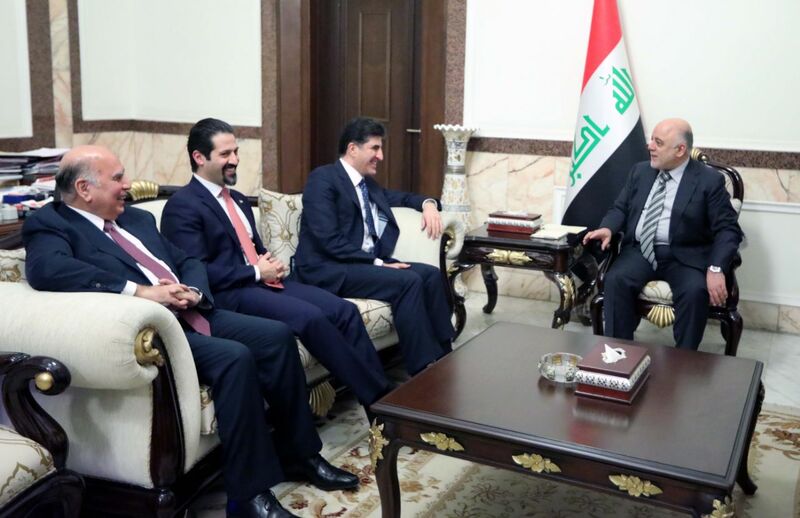 Dr. Al-Abadi has renewed the government's position, and the region must obey the constitution in the borders issues, noting on the importance of handing over the extracted oil to the federal authorities and the export of oil exclusively by the federal government through the Oil Company SOMO. His Excellency has stressed on the importance of completing the work of the committees that review the region's employees' salaries, accelerating it process, ensuring reaching to eligible employees and it should be subject to the Federal Audit Bureau's control.